Google enjoyed search engine dominance for decades. But this streak may be coming to an end, at least when it comes to eCommerce. According to a recent survey by Survata, 49% of US internet users started product searches on Amazon, compared to 36% who went to Google first. This shift can be partially attributed to customers being further down the conversion funnel when they search on Amazon, whereas users tend to use Google when they are in the research stage of their purchasing journey. Marketers know that the bottom of the sales funnel garners a much higher conversion rate than at the top. Because of this, Amazon Ads offers businesses an opportunity to capture buyers when they’re most likely to convert. So which platform should eCommerce sellers advertise on to maximize sales? What are the key differences between Amazon Advertising (formerly known as Amazon Marketing Services) and Google Ads (previously Google Adwords)? Here, we explore the ad formats, differences, and benefits of each advertising channel. 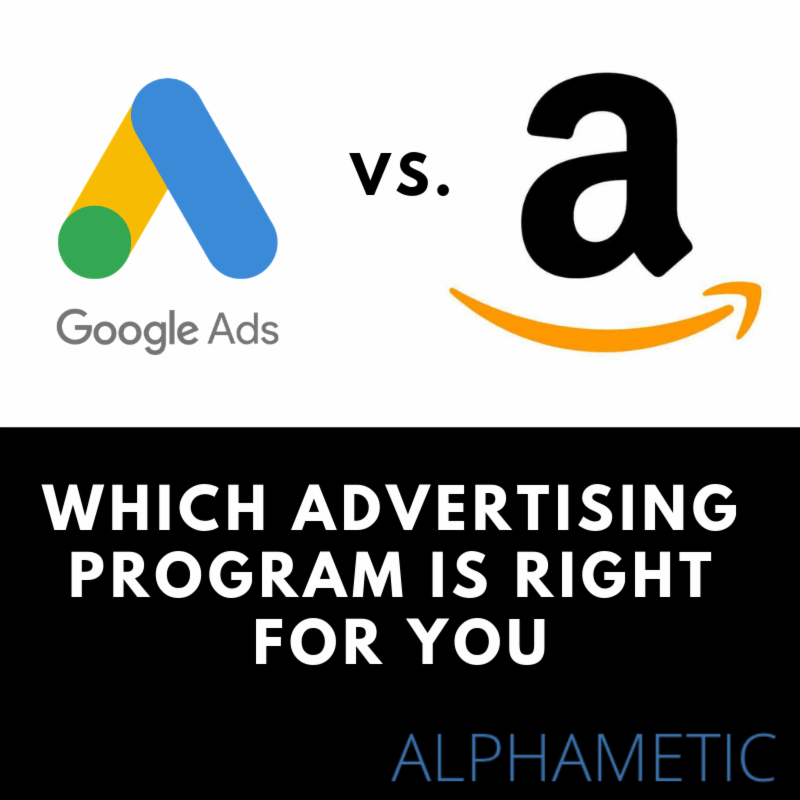 Which is Better: Google Ads or Amazon Ads? As the name implies, this ad type is text-based, providing a headline and product details. This ad type displays at the top of the search engine results page (SERP), above organic listings. 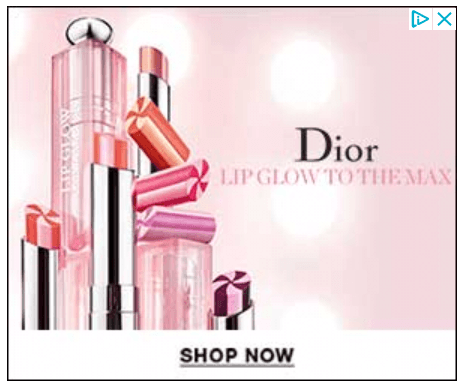 This type of ad will adjust its shape to fit into the available space. Recently, Google also added the option for marketers to set up one ad with multiple headlines, and test combinations of that ad to achieve the advertiser’s stated goal. Google Image ads can be static or interactive graphics, such as .gif or Flash formats. These ads can appear on the Google SERP and across the Google Network, including the Search Network, search partners, and the Display Network. 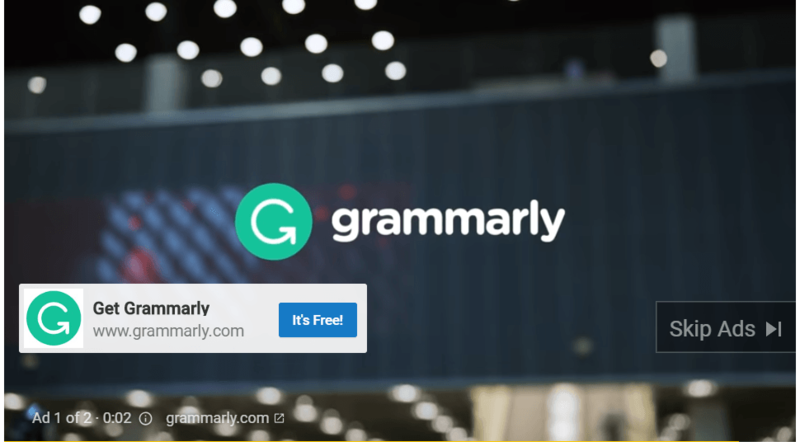 Google Video ads can either run standalone or be inserted into streaming video content, like the above Grammarly ad that played during a YouTube video. Google Shopping Product ads display images and product details such as rating, price and merchant. This ad type is displayed at the very top of the SERP, above Text ads and organic results. Google Showcase Shopping ads display the various stores that sell the product you’re looking for. Once the user clicks on a particular merchant, the ad expands to display a new layout or brochure of products. This ad type is displayed at the top of the SERP. Amazon has far fewer ad types than Google Ads, and only display on the Amazon site (as opposed to multiple websites, like the Google Display Network). 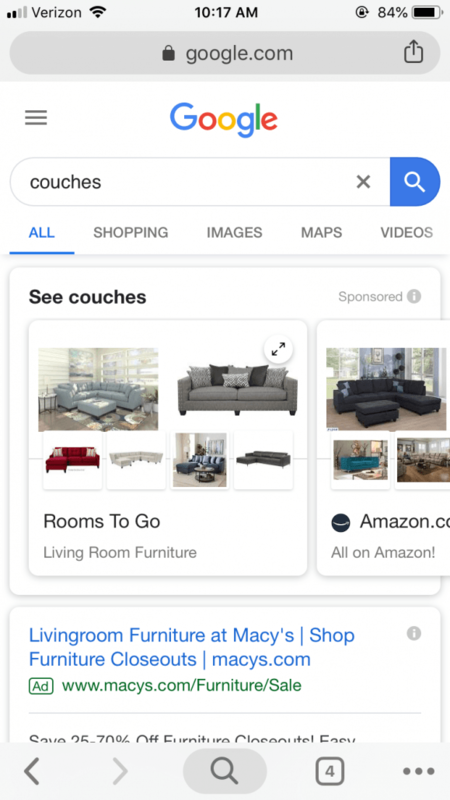 These keyword-targeted ads are usually displayed above or below the search results page, as well as on other product detail pages. Sponsored Brand ads display as a headline banner ad on the search results page. These ads are also keyword-targeted and cost-per-click. This type of ad can be used to promote 3 or more products together, as shown in the above screenshot. 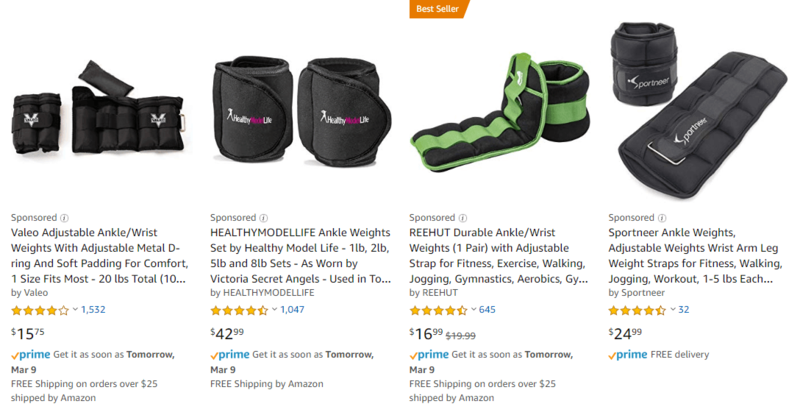 Product Display Ads show up in the sidebar below the Add to Cart button on a competitor’s product, or at the bottom of the product page. 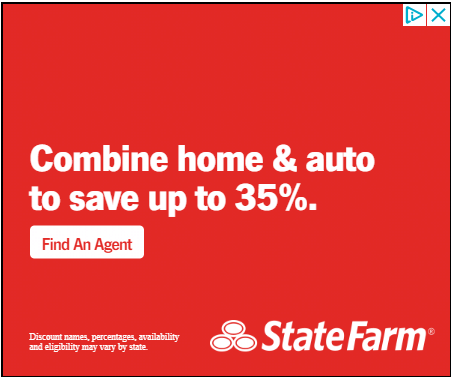 This type of ad can be seen as a last-ditch effort to get the user to switch over to your product, as opposed to your competitor’s. While both programs can be used to promote products, Google Ads and Amazon Advertising have very distinct features and capabilities. Because shoppers are further down the conversion funnel when they search on Amazon, the goal of Amazon Ads is to convert directly. Because of this, Amazon Ads will never lead to a different site. 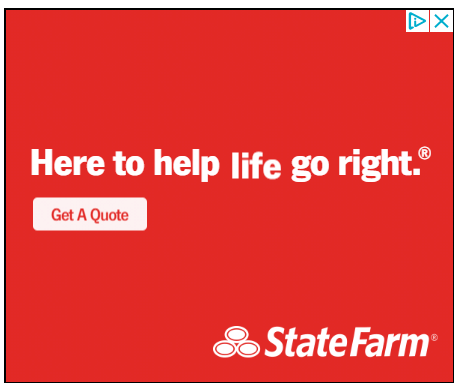 Google, on the other hand, makes money when a user clicks on the ad. For this reason, Google Ads are optimized to catch the user’s attention. Google Ads, unlike Amazon, lead to the brand’s website. Google, therefore, prioritizes Click-Through-Rate (CTR) when optimizing ads. This means that Ads will prioritize eye-catching, “clickable” ads. Amazon ranks ads based on which one is most likely to lead to a sale. They determine the convertibility of an ad based on a combination of Performance Metrics (CTR history, conversion rate, overall sales) and Relevance Metrics (product title, description, search terms, seller name). Both Google Ads and Amazon Ads use Broad Match (least competitive), Phrase Match (moderately competitive), and Exact Match (most competitive) keywords for bidding. In addition to these keyword types, Google has an additional match type called Modified Broad Match. This match type makes the Broad Match more specific by allowing their product to appear for misspellings, singular/plural forms, abbreviations, and acronyms of that word. 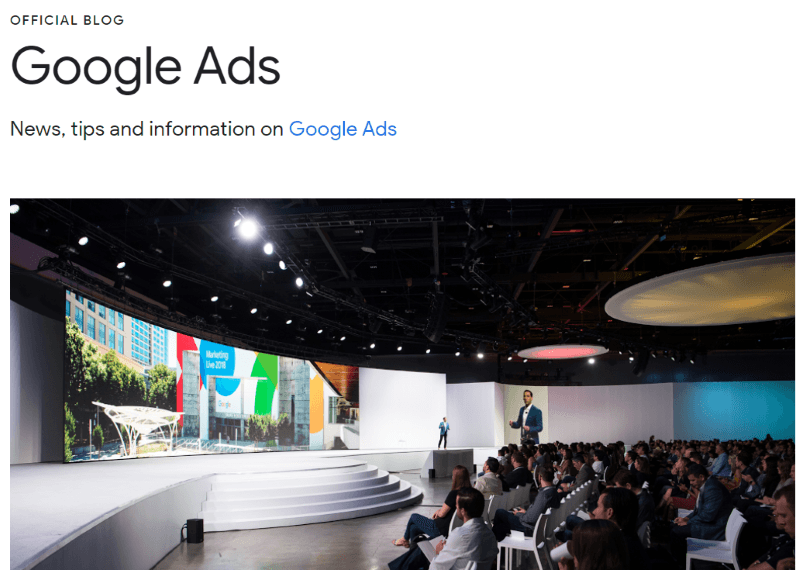 Because Google Ads direct shoppers to the brand’s website, the advertiser is able to track user information such as demographics, keywords, and geographic location. Amazon, on the other hand, is limited to the data it collects on the Amazon website itself, such as purchase history, returns, and conversion data. Further, Amazon will only capture shopper information if they convert on your product page. While Amazon is making an effort to broaden its targeting options, it still lags behind Google’s robust analytical capabilities. Ad campaign success can be measured by each platform’s respective ROI metric. For Amazon, this metric is called the Advertising Cost of Sales, or ACoS. This is calculated by dividing the total ad spend by total ad sales. Google uses Revenue over Ad Spend (RoAS), which can be found by dividing advertising revenue by the dollar amount that is spent on that ad. In this way, RoAS is the inverse of ACoS. Amazon introduced two Dynamic bid options, down-only bidding and up-and-down bidding, as well as a Fixed Bid option. The dynamic bid options will lower or raise your bids in real time based on how likely your ad is to convert. Fixed bids are just what they sound like – the bid that you set stays that way. Dynamic bids offer advertisers a more hands-off paid campaign management option. This tool allows advertisers to choose how much they’re willing to adjust their bid to stay at the top of the page or to show up on product pages. Previously, advertisers could only target sponsored product ads by keyword. With this update, you have the option to target by ASIN or product category. Previously, there was only an option to bid for clicks. Now, advertisers have the option to bid based on conversions. This can save advertisers money by not having to pay for clicks that don’t convert. This setting enables Google to look for high-performing audiences that are similar to your target audience. This capability allows advertisers to expand their reach, without increasing bids on existing campaigns. Advertisers can now include “video assets” to their ads, creating a more responsive ad experience. Google also came out with the ad strength tool, which allows advertisers to improve the performance and optimization of their display ads. So which one is better: Google Ads or Amazon Ads? Because Google and Amazon attract consumers from different parts of the funnel, the platform you choose depends on what your goals are (and where you sell your products). If you’re looking to grow brand awareness and web traffic, Google Ads may be the platform to use since the ads direct users to your site. Although Amazon Advertising can contribute to overall brand awareness as well, Google still reigns supreme in individuals at the beginning of the buyer’s journey who are simply searching for a solution to their problem. If you’re less interested in bringing users to a particular landing page on your site and are more focused on making immediate sales, you may want to invest more in Amazon. Amazon has a customer base that is primed (no pun intended) to buy. Your customer acquisition timeline can be considerably shorter on Amazon. At the end of the day, if you’d like your website to perform well, you should invest in Google Ads. And if you’d like your Amazon storefront to also perform well – you need to invest in Amazon Advertising. Both platforms can mutually benefit from each other by becoming credibility drivers for your products, as well as your brand. We recommend anyone in eCommerce to test out both advertising programs to see which one is driving the most return. For most businesses, the answer may be to advertise on both platforms. How you break down your PPC budget between the two will depend on campaign results, sales, the KPI’s you care about and more. As any advertiser knows, the key to a successful paid ad campaign is continual testing. Whether you choose to invest in Google Ads or Amazon Ads, always monitor your KPIs, analyze your metrics, and be open to adjusting your strategy. 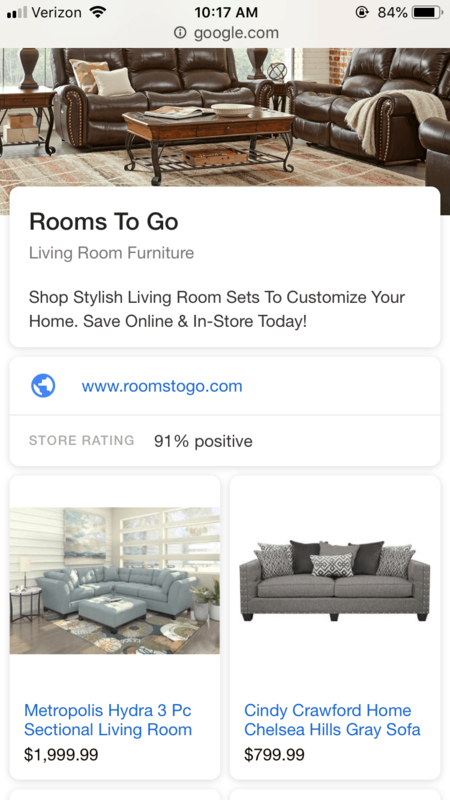 If you’d like to read more about PPC updates, check out You Can Now See if Your Google Ads Drive In-Store Visits – Learn How.